By the way, these aren’t presented in any particular order. No technique is better or more common than another technique. When you employ brainstorming to identify requirements, make sure you have representation from all the various stakeholder groups. This helps ensure you have input from everyone impacted by the product and project. The nominal group technique is often used in conjunction with brainstorming. When all the requirements have been generated (or as many as can be generated at the time), the group ranks them. This can be as simple as members listing their top five requirements. The requirements are then prioritized for development, based upon the stakeholder ranking. The Delphi technique was designed to bring a group of experts to consensus. The thought process is that a group of experts reaching a conclusion is better than any one expert’s conclusion. Some benefits to using the Delphi technique are that it allows you to get information from a wide group of people that are geographically disbursed, and you can do it easily by using an automated survey tool. A group of stakeholders or experts are identified, depending on the needs of the project. Each stakeholder is sent a list of high-level requirements and asked to expand that list and send it back to the facilitator. The facilitator compiles a comprehensive list of requirements and sends it back to the stakeholders for prioritization. Each stakeholder prioritizes the requirements and sends it back to the facilitator. Several rounds of this take place until you can reach a reasonable amount of consensus on the requirements and their priority. One of the important things to know about the Delphi technique is that stakeholders must remain anonymous to each other, at least for the first couple of rounds. This allows free and unbiased participation by participants. Being anonymous also frees stakeholders from being intimidated by people with more knowledge, or a bigger title, or more experience. What type of outdoor activities would you like at the center? 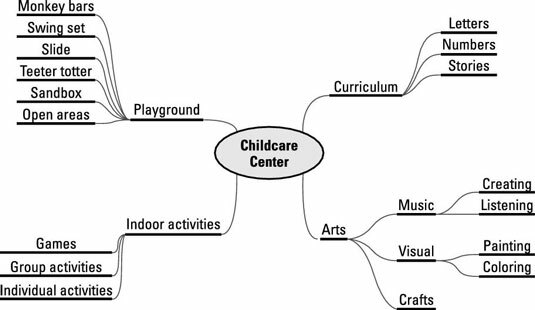 What type of indoor activities would you like at the center? What topics would you like to see taught? What types of food do you think should be available? After you generate options, you could then ask the parents to rank all the possible requirements. A mind map is a technique that starts with the idea (or in this case, the project) in the middle, and then stakeholders branch out from the central idea and generate more ideas (or in this case, requirements). A mind map can give you an overview of the project. This overview allows you to determine whether there is an imbalance in requirements or whether one set of needs was weighted more heavily than others. An affinity diagram takes ideas and groups them into categories with similar ideas or requirements. Thus, they are grouped with ideas that they have an “affinity” with. Affinity diagrams can be used alone or in conjunction with brainstorming and the nominal group technique. When gathering requirements, you often need to balance several criteria to determine the best set or requirements for a product, service, or result. Multicriteria decision analysis identifies the various criteria that you will use to evaluate requirements and then assigns a weighted value to each criteria. Then solutions are rated against the criteria. Three vendors were evaluated against all criteria, which were weighted differently and then ranked on a scale of 1 to 5 (1 being low, and 5 being high). You could set up a table to show how each vendor scored to establish a quantitative method for selecting the best vendor based on the requirements. You aren’t limited to using just one group creativity technique. Using the running childcare center example, you can see how a specific technique is well suited for one phase and then easily flows into using another technique. Brainstorming: You lead a session to collect parents’ needs, wants, and expectations, all of which are written on sticky notes and put on the wall. Affinity diagram: You ask the parents to come up to the wall and start putting the sticky note ideas into groups. You’ll probably see some negotiating about how to arrange and group the sticky notes, but eventually, people will settle on something they can live with. Nominal group technique: Finally, you prioritize the sticky notes into your list of requirements.